On July 28, 1863, Union Col. Samuel P. Spear's cavalrymen came thundering through Jackson from Federal-occupied Winton to destroy the Wilmington and Weldon Railroad Bridge over the Roanoke River at Weldon. Confederate Gen. Matt W. Ransom and his staff raced just ahead of them in a running shootout, having been surprised half a mile from town. As Ransom galloped across the mill tail bridge shouting orders, a few of his men, bathing in the millpond, were likewise surprised when bullets began splashing the water around them, and they started scrambling for their weapons. the shelling of the earthworks. After the artillery barrage, Spear's flanking attempts failed on the Confederate left and right. 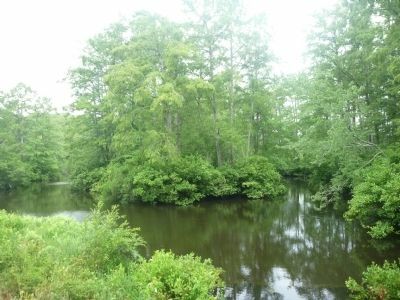 Since it was late in the day and his force was in an isolated position, Spear withdrew with three dead and a few wounded through Jackson to Deloatche's Mill at present day Creeksville. The next day he returned to Murfreesboro and then to Winton, which the Federals evacuated the day after. Ransom had one man killed. 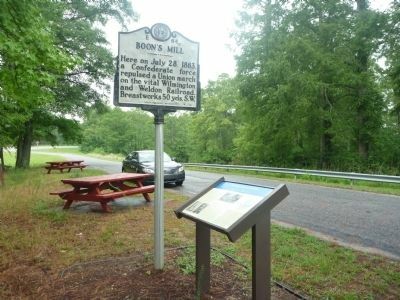 The Boone's Mill fight saved the Weldon Railroad Bridge, allowing much-needed supplies to continue on to Richmond. Location. 36° 22.646′ N, 77° 27.152′ W. Marker is in Jackson, North Carolina, in Northampton County. Marker is on U.S. 158 half a mile west of Barrows Mill Road, on the left when traveling east. Touch for map. Marker is in this post office area: Jackson NC 27845, United States of America. Touch for directions. (approx. 2 miles away); Matt W. Ransom (approx. 2.2 miles away); Caledonia (approx. 7½ miles away); Halifax Runaway Ads (approx. 8.1 miles away). Touch for a list and map of all markers in Jackson. More. 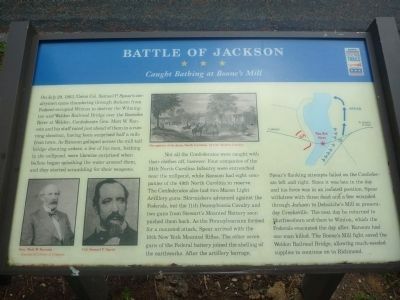 Search the internet for Battle of Jackson. Credits. This page was last revised on June 16, 2016. This page originally submitted on June 14, 2011, by Dave Simpson of Durham, North Carolina. This page has been viewed 889 times since then and 10 times this year. Photos: 1, 2, 3. submitted on June 14, 2011, by Dave Simpson of Durham, North Carolina. • Craig Swain was the editor who published this page.